Mumbai: Investors continued to sell shares of Orchid Chemicals and Pharmaceuticals Ltd on fears that its margins would be hit after the sale of its profitable injectable formulation division to US-based drug maker Hospira Inc.
On Monday, the Orchid stock lost 5.45% even as the benchmark Bombay Stock Exchange Sensex lost 0.71%. The deal is to be consummated in March. The company has said that a new contract deal with Hospira to supply active ingredients for the injectable products and a savings on the interest cost would compensate for the loss of its most profitable business. Analysts, however, are of the view that these factors will not be able to cover up the margin loss from the divestment. Mumbai-based brokerage Angel Broking Ltd has said in its latest report on Monday that with the sell off of the high-margin injectable business, Orchid’s future sales mix is expected to change dramatically from existing equal or 50:50 focus on active ingredient supply and finished product sales to 78:22 ratio in the next two years. “The company is likely to see compression in operational profit from 23.7% that is expected in 2010 to 16.5% in 2012," said Angel’s pharma analysts Sarabjit Kaur Nangra and Sushant Dalmia. “It’s a conservatively assumed value, though an accurate valuation would be difficult as the ingredient supply contract is a private deal between two individual companies," Nangra told Mint. Angel’s prediction is on the basis that the injectables business that could have contributed $182 million in 2011 and $215 million in 2012 cannot be compensated by Hospira’s new ingredient supply contract, which has a revenue potential of up to $55 milliona year. The Orchid spokesman declined comment. 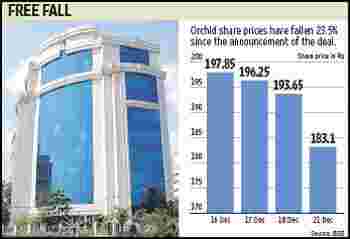 Another sector analyst from a foreign brokerage, who did not want to be identified as his firm’s media policy does not allow this, said Orchid’s operating profit was definitely going to be affected from April as the key business was out now. “But savings from the interest cost and staff cost would give a positive effect on the net profit of the company," he said. The Angel report, however, said the company’s savings of about Rs200 crore on interest and Rs30 crore on depreciation will be inadequate to compensate for the earnings loss resulted from the divested business. “It further fortifies its business model with long-term contractual API (active pharmaceutical ingredients) revenue streams, and also enhances its financial flexibility to pursue new growth opportunities, and creates a road map to continue delivering shareholder value," Orchid’s managing director K. Raghavendra Rao said, while announcing the deal last week.